Monkeys come in a wide range of shapes and sizes, from large baboons to tiny marmosets. No matter what they plan to make their next meal, monkeys have developed adaptations that help them hunt their food. Prehensile tails, large family groups and the use of tools all ensure monkeys have a full belly. Monkeys are divided into two main groups: New World and Old World monkeys. Old World monkeys live in Africa and Asia and include baboons, macaques and colobus monkeys. New World monkeys -- like capuchins and howler monkeys -- live in Central and South America. Some monkeys are omnivores, eating fruits, nuts, seeds, insects and meat, like small birds or crabs. Other monkeys are strict herbivores, living in trees and eating mostly leaves. While Old World monkeys lack them, many kinds of New World monkeys have prehensile tails. Prehensile means they are able to use their tail almost like a third hand, utilizing it to help them climb or hang from branches. Monkeys like capuchins and howler monkeys use their tails to get around in their homes in the trees, accessing hard to reach spaces to find food. Since most of their diet consists of leaves, having a prehensile tail makes reaching almost all parts of the tree for a meal a breeze. They also use their tails to hang from branches while eating. Most primates, including monkeys, live in large family groups. By living in large groups for their entire lives, monkeys can learn valuable information about how and where to find food from experienced elders in the group. Being in large groups allows monkeys to protect food resources from other groups of monkeys. This is especially true of resources that can be scarce, like a particular kind of fruit. Monkeys who live in trees tend to live in smaller groups, since food sources are plentiful and the risk of predation is lower than for ground-dwelling monkeys. 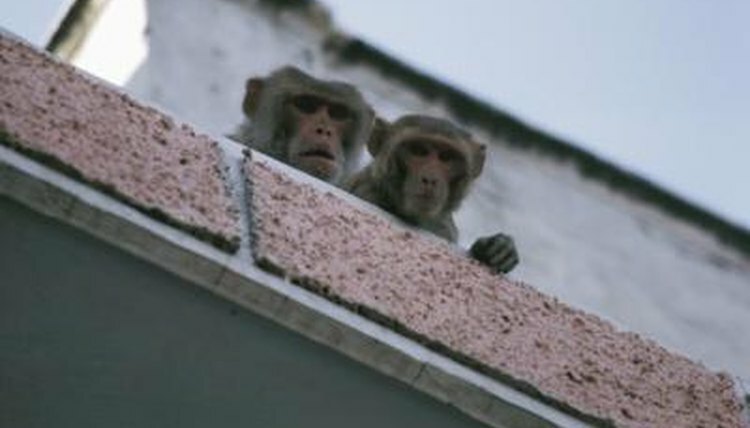 The rhesus monkey, an Old World monkey who lives mostly on the ground, lives in groups of up to 200 members. Very few creatures aside from humans use tools. Capuchin monkeys are one of the only types of monkeys that have adapted to using tools. When comparing the size of the brain to the size of the body, capuchins are second only to humans in brain size amongst primates. They will collect palm nuts, dry them for a few days and use rocks to crack them open. They also use rocks to dig up plants and smash larger foods, like lizards, into smaller pieces. To get at insects inside a log or other confined place, capuchins will use sticks. What Animal Sleeps Upside Down by Its Tail?